The Sub Urban logo in Grand Theft Auto: San Andreas. Sub Urban is a clothing store in Grand Theft Auto: San Andreas and Grand Theft Auto V.
Unlocked after "Nines and AKs", Sub Urban is one of three clothing stores initially made available in the game (alongside Binco and ProLaps). Presumably marketing to those interested in modern urbanwear, the store's interior is decorated in a gritty urban theme, and even features a stage, which use is unknown. Creek, Las Venturas, at the Creek strip mall. 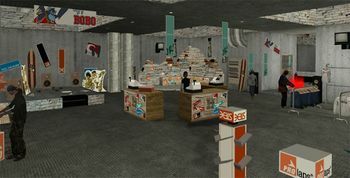 Shared interior of all Sub Urban clothing shops in GTA San Andreas. Sub Urban may be considered a lower-mid range clothing outlet, and like Binco, specializes in generic attire or urbanwear popular among street gangs. However, items on offer in the store generally cost more than those in Binco, though they are still priced reasonably as most of them still cost below $100. For a comprehensive list of clothing available from Sub Urban in GTA San Andreas, see /Clothing in GTA San Andreas. As implied, the outlet's name is likely to a jab on the trend of selling urban attire to those who are not even city folk to begin with, such as suburbanites. The interior of the shop has a surfboard with a Rockstar Games logo on it, along with a plaid pattern. By zooming in on the mirrors next to the changing rooms with a Camera or a Sniper Rifle, the player can catch a glimpse of a portion of the outlying "blue hell"; an Ammu-Nation store layout, complete with a shooting range, is also visible from that position. The brand is mentioned in passing in Grand Theft Auto IV, where it is advertised on the Designerslave.com website and owns the White Widow brand. Alternate logo, GTA San Andreas. Sub Urban billboard, GTA San Andreas. This page was last modified on 23 March 2014, at 20:05.